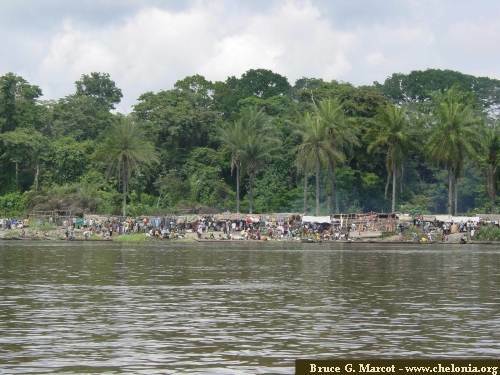 During August-September 2004 I engaged in an expedition to western Democratic Republic of the Congo (DR Congo). During this trip, I encountered two turtle species in villages along a remote section of the Ubange River approximately 5-50 km north of the confluence with the Congo River. 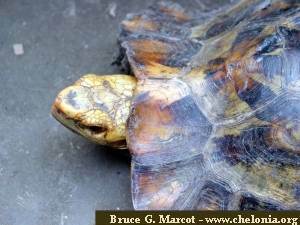 On 8 September 2004, in Bobangi village (0o 6.67’ S latitude, 17 o 43.26 E longitude, established by GPS), I encountered a specimen of Pelusios chapini or Central African Mud Turtle. 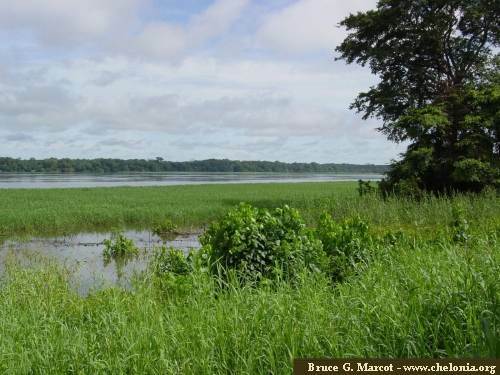 Bobangi is situated along the banks of the Ubange River in seasonally flooded riparian gallery forests with floodplain grasses and shrubs. Apparently, many specimens of Pelusios housed in zoos and collections in the U.S. are misidentified to species (D. Senneke, personal communication). Photos I took may be one of the first taken of P. chipini, at least in its native environment. This specimen was a male, evidenced by the obviously concave plastron, and measured 27 cm carapace length (curved measure) and 21 cm plastron length (straight-line measure). I encountered this specimen in a most interesting manner. It was presented to me as a gift, along with a live duck and bunches of plantains, by the chief of Bobangi and his council. Along with colleagues from USDA Forest Service and the non-government organization Innovative Resources Management, I had spent several days in Bobangi as part of our work with local villagers to help them establish sustainable forest resource management at the community level. The chief knew of my interest and expertise in wildlife ecology, and presented me with this specimen as a token of appreciation. Apparently, it had been captured in the local riparian forest and was alive and well (no signs of ecoparasites or disease). We kept it alive and I urged our expedition hosts to release it back into the wild further downriver. On 9 September 2004, in a riverside market in Mobenzino village (0o 22.80’ S latitude, 17 o 45.16 E longitude) along the banks of the Oubange River, I encountered five specimens of Kinixys erosa or Forest Hingeback (also called Eroded Hingeback, Serrated Hingeback, Rosy Hingeback, and Schweigger Hingeback) being sold for food (bushmeat). Much of the wildlife of western DR Congo, including herps, birds, and mammals, has been greatly reduced or locally decimated by local subsistence hunting, by the illegal bushmeat trade, and by direct exploitation or habitat loss caused by recent war. 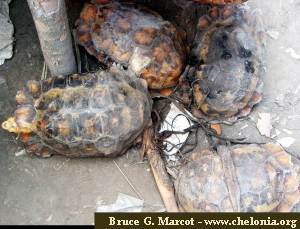 Influence of such practices on turtle populations needs study to determine if these two species and others are secure or in peril. I spent several weeks in pirogues (dugout canoes) and trekking in swamp forests and riparian forests, and saw no other turtles. 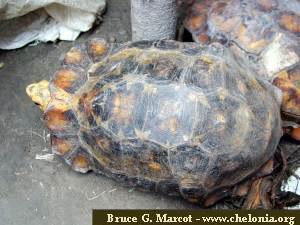 I thank Darrell Senneke, Director of World Chelonian Trust, for helping with the identifications and providing information on these species. My photos of Pelusios were also identified by Hynek Prokop of Czechoslovakia, Dr. Harald Artner of Austria, and Ferry Gruneward of Netherlands. My photos of Kinixys were identified by Chris Tabaka, D.V.M., Paula Morris, and Ken Carlsen, United States. My appreciation to all these experts.